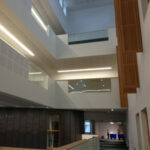 The conference will be held at the University of Bath in the Chancellors’ Building, a state of the art teaching and learning facility that was completed in 2013. Parking is available for £5 for the duration of the conference. Registration is now open via the University of Bath online store. Membership must be active at the time of the conference to receive the membership discount. Non-members can find out how to join BAICE here. The University of Bath is easily accessible by rail, coach, air and car. From London (Heathrow) Airport: It is possible to travel to Bath from Heathrow by rail or coach. Rail service is through connection at London Paddington: take the Heathrow Express to London Paddington (15 minutes) and then a connecting train to Bath Spa station. Tickets can be purchased at from the First Great Western website be sure to book in advance for the best prices. From London (Gatwick) Airport: Rail is the best option. The journey takes approximately 2 hours with a connection in Reading. Tickets can be purchased at National Rail Enquiries, be sure to book in advance for the best prices. From London (including Stansted and Luton Airports): Travel by rail or coach to central London, and take the tube to Paddington station. Follow directions for rail transport below. From Bristol Airport: The A4 bus service runs from Bristol airport to Bath, direct and takes approximately one hour. It leaves Bath on the hour and Bristol airport at half past the hour. Return tickets are £17 for full fare and £15 for students. More information is available from the Bath Bus Company. By Rail: Trains run to London Paddington every 30 minutes and take 90 minutes. Tickets are usually cheaper if bought in advance and considerably cheaper in off-peak times. For fares and times consult the First Great Western website. By Coach: Coach (long distance bus) is the most economical way to reach Bath. Tickets can be bought at NationalExpress.com, with some tickets available for under £10. By Car: Bath can be reached from the M4 Junction 18. Delegates should proceed to the East Car Park (see map here), parking permits will be available for purchase on the day of arrival for £5 for the entire conference. Satnav users can enter the postcode BA2 7PA for directions to the East Car Park. The University can easily be reached by bus or taxi from the city centre. By Bus: Catch the 18 or U18 bus service from the city centre. 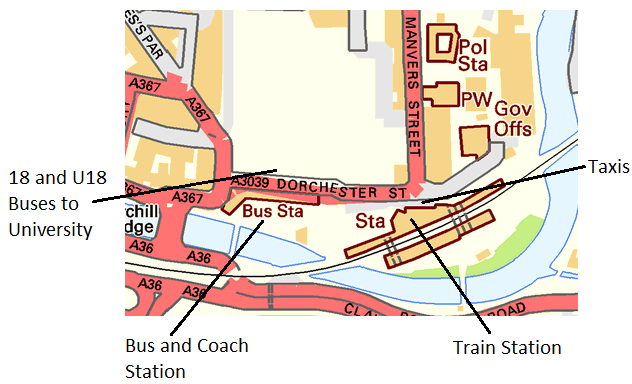 Bus stops are directly opposite the bus stations (to your left when leaving the train station) as indicated on the map below. Buses run approximately every 10 minutes on Monday to Saturday and every twenty minutes on Sunday, fares start from £3.00 for an all-day pass. By Taxi: Taxis are available directly outside the Bath Spa rail station, which is a short walk from the bus station (see arrival map). Alternatively, Abbey Taxis (01225 444 444) provide a convenient taxi service. Fares from the city centre to the University cost approximately £10. The conference organizers welcome papers on any topic relating to comparative and international education, including but not limited to empirical research, single country case studies, policy analysis, synthetic analysis, theory, and work from related fields such as international development studies and youth studies. Over the last ten years there has been a growing tendency for both national governments and international agencies, such as the World Bank and UNESCO, to use large scale data sets from cross-national comparisons in studies, such as TIMMS and PISA, to benchmark and normalise school system performance. This has brought new challenges and opportunities for international and comparative research in education. This sub-theme will explore the potential and difficulties of using cross-national comparison on pupil performance to inform educational policy making. Papers are invited that reflect on these trends in terms of methodological advances, in both quantitative and qualitative methods, which may enable alternative political, sociological, epistemological and ethical perspectives to be explored. One dimension of the rapidly changing context for education internationally is the challenge to the traditional notion of education as a national commodity. Prompted by increasing global mobility of professional families, the development of international schools catering for expatriate children provided the context in the mid 20th century for the creation of the first international curriculum programmes, which also responded to a post-war ideological concern for the promotion of what might be described as ‘international mindedness’. The number of international programmes continues to grow, while more corporate forms of international schools are rapidly emerging, and both are increasingly being adopted within national contexts by socio-economic elites. At the same time, national education systems in some contexts are increasingly developing international dimensions, with a growing focus on what might be described as global citizenship. This sub-theme will debate issues relating particularly to school-level education, international curricula, international schools and the internationalisation of education within national contexts. In diverse contexts the content of curricula is increasingly taught through the medium of an international language. This has long been the case in many postcolonial contexts. But for many parents an ‘international’ primary or secondary education is nowadays synonymous with instruction in English. Meanwhile, universities in non-Anglophone countries are increasingly offering English-medium degree programmes in a range of subjects. This raises issues of crucial importance in terms of language, ideology and cultural identity. For example, when subjects such as mathematics, science and technology are taught in an international language, what associations do students form between the message and the medium? Conversely, when subjects such as art and history are taught through a minority language, does this lead students to perceive that language as being connected with tradition and heritage rather than modernity? Moreover, when students are instructed in a medium that is not their mother tongue, how does this shape the perception and construction of their own identities? This sub-theme invites research papers that offer critical and illuminative explorations of the use of international languages as academic lingua franca and other issues relating to language and power in education. Possible topics for submission include but are not limited to: the dominance of English scientific and academic terminology, the links between language policy and the hidden curriculum, and the role of ‘minority’ languages in a globalised educational context. We are particularly interested in submissions that involve the use of innovative contemporary research methods. Many governments throughout the world are prioritising success in “the knowledge economy,” a strategy that places on particular emphasis education. Specifically, education is seen as essential to developing highly skilled labour in high-demand areas, which attracts well-paying jobs from multinational companies and increases national exports. However, the widespread adoption of educational policies oriented towards the knowledge economy has unintended consequences: as the supply of high-skilled labour increases, its value declines. With increased free trade around the world, multinational companies are then able to move labour around the world to wherever it can be performed at the lowest cost. This sub-theme invites papers that look critically at the concepts skills and the knowledge economy. Conflict and justice have long been concerns of educationalists. However, these research agendas are largely separate within contemporary comparative and international education. A growing body of research is being produced around education and conflict, or education in emergencies, and scholars continue to explore relationships between education and justice, including by drawing on the ideas of Amartya Sen, exploring work in social justice, human rights, critical theory and by drawing on legal principles, including around transitional justice. This thematic group welcomes papers from scholars working on any of these (or other relevant) issues and seeks to open conversations and explore linkages between education, conflict and conceptions of justice. What do changing development politics, agendas, theories and goals mean for childhood, youth and learning post-2015? How can new partnerships transform opportunities for children and youth living in poverty? What innovations and pedagogies improve teaching and learning for development? The New Politics of Education Policy Agendas: the role and priorities of established and newly emerging national, regional and supranational institutions and actors in education policy and practice. The New Governance of Education: developing governance architectures with the emergence of non-state, commercial and non-governmental institutions and actors in the funding, ownership and regulation of education activities at a range of scales. Education and Power: the implications of private, not-for-profit, commercial and shadow education sectors for local and national education policy and practice. BAICE Bursaries are available to early career researchers, deadline 15 June. More information on how to apply. I am in Cameroon and will like to join you as we also work to improve education. I am interested in your conference.